Great Size for Ultimate User Control! 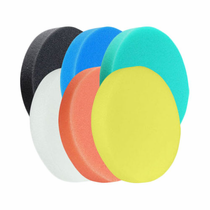 Flat Pad for Complete Surface Polishing! Buff & Shine 5.5" Flat Faced DA Foam Grip Pad� Mix & Match 6 Pack allows you to pick and choose the pads you need to get the job done. They were designed with high quality foam for optimal performance and longevity. The low profile 7/8� foam makes them ideal for DA Polishers. The pads work best with the Buff & Shine 500Y 5� Backing Plate.